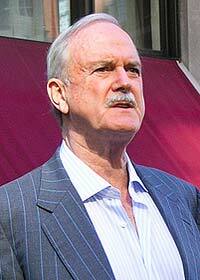 Famous British actor, comedian and writer best known for his work with the Monty Python group, Fawlty Towers and many other films and tv shows. Reg: "We now propose that all seven of these ex-brothers be now entered in the minutes as probationary martyrs to the cause." Reg: "We need doers in our movement, Brian. But, before you join us, know this. There is not one of us who would not gladly suffer death to rid this country of the Romans once and for all." Reg: "Ah, yeah there's one. But otherwise, we're solid! Are you with us?" Reg: "They've bled us white, the bastards. They've taken everything we had, and not just from us, from our fathers, and from our fathers' fathers." Loretta: "And from our fathers' fathers' fathers." Loretta: "And from our fathers' fathers' fathers' fathers." Reg: "All right Stan, don't labor the point. And what have they ever given us in return?!" Reg: "Oh, yeah yeah they did give us that. That's true." Loretta: "Oh yeah, the sanitation Reg. Remember what the city used to be like." Reg: "Alright, I'll grant you the aqueduct and the sanitation. The two things the Roman's have done." Reg: "Well obviously the roads. I mean, the roads go without saying, don't they. But apart from the sanitation, the aqueduct and the roads..."
Reg: "All right, fair enough." Francis: "Yeah, that's something we'd really miss Reg, if the Romans left." Loretta: "And it's safe to walk on the streets at night now, Reg." Francis: "Yeah they certainly like to keep order. Let's face it. They're the only ones who could in a place like this." Reg: "All right, but apart from the sanitation, the medicine, education, wine, public order, irrigation, roads, a fresh water system, and public health, what have the Romans ever done for us?" Reg: "Oh peace? Shut up!" Brian: "I hate the Romans already!" Reg: "Listen, if you wanted to join the PFJ, you'd have to really hate the Romans." Reg: "Oh yeah? How much?" Prince Charming:"Do you think so..... dad... I was so hoping you'd approve." Fairy Godmother:"You remember my son... Prince Charming." King:"Charming! Is that you! My gosh its been years! When did you get back?" Charming:"Oh about 5 minutes ago actually... After I endured blistering winds, scorching deserts! I climbed to the highest peak in the tallest tower!!..." Fairy Godmother:"Mummy can handle this.... He endures blistering winds and scorching deserts! He climbs to the highest bloody room at the tallest bloody tower! And what does he find? Some gender confused wolf telling him that his princess is already married!" Fairy Godmother:"You see we made a deal Harold. And I assume you don't want me to go back on my part." Puss in Boots:"Who dares enter my room?!" King:"Sorry I hope I'm not interrupting but I'm told your the one to talk to about an... ogre problem?" Puss in Boots:"You are told correct... but for this I charge a great deal of money." Puss in Boots:"You have engaged my valuable services your majesty. Just tell me where I can find this ogre." King:"So I suppose any grandchildren I could expect from you would be..."
Queen:"Not that there's anything wrong with that.... right harold?!" King:"Oh no no of course not. That is assuming that you don't eat your own young!" Shrek:"Oh no! We usually prefer the ones who've been locked away in a tower!" King:"I only did that because I love her!" Shrek:"Oh aye! Daycare? Or dragon guarded castle!" King:"You wouldn't understand! Your not her father!" King:"I'm sorry Lillian... I just wish I could be the man you deserve." Queen:"Your more that man today than you ever were... warts and all." Fairy Godmother:"Uh ok, two renaissance rats, no mayo, chili rings..."
Charming:"I'll have the medieval meal." Fairy Godmother:"Yeah one medieval meal... and Harold? Curly fries?" King:"Excuse me... I'm looking for the ugly stepsister? Ahh... there you are."